What better way to celebrate Halloween than to send a scary balloon gift! No fluffy bunnies here! We have spiders, ghosts, bats, skulls, witches, haunted houses, pumpkins, and huge blood shot eyes! All are guaranteed to put the wind up the most hardened cynic. We will prepare your Halloween balloon choice in the spookiest way possible and dispatch it to arrive on a day of your choice. Our balloons last at least a week fully inflated and most last for a month or more! 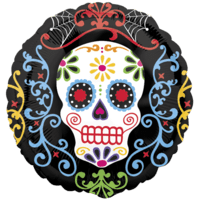 This Superb Day Of The Dead Colourful Balloon Gift will intrigue and thrill a lucky family member or friend! Expertly put together and blown up by our in house qualified balloon decorators! 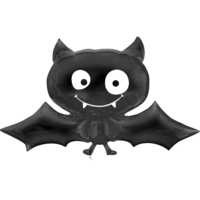 This Superb Black Bat Balloon Gift will intrigue and thrill a lucky family member or friend! Expertly put together and blown up by our in house qualified balloon decorators! 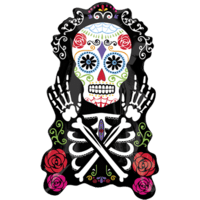 This Superb Day Of The Dead Patterned Balloon Gift will intrigue and thrill a lucky family member or friend! Expertly put together and blown up by our in house qualified balloon decorators! 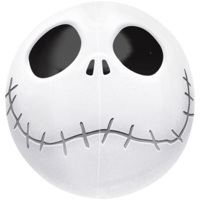 This Superb Orbz Jack Skellington Head Balloon Gift will intrigue and thrill a lucky family member or friend! Expertly put together and blown up by our in house qualified balloon decorators! 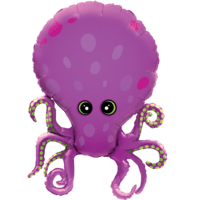 This Superb Purple Ocotopus Balloon Gift will intrigue and thrill a lucky family member or friend! Expertly put together and blown up by our in house qualified balloon decorators! 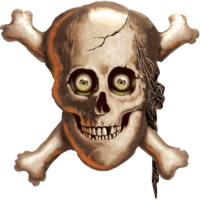 This Superb Skull & Crossbones Balloon Gift will intrigue and thrill a lucky family member or friend! Expertly put together and blown up by our in house qualified balloon decorators! 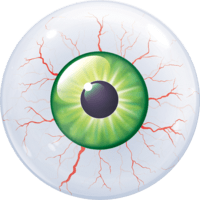 This Superb Big Horrible Eyeball Bubble Balloon Gift will intrigue and thrill a lucky family member or friend! Expertly put together and blown up by our in house qualified balloon decorators! 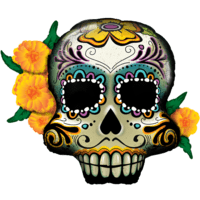 This Superb 38" Day of the Dead Skull and Flowers Balloon Gift will intrigue and thrill a lucky family member or friend! Expertly put together and blown up by our in house qualified balloon decorators!